Rejected for the Academy show, Rousseau submitted it under th other title to the Salon de Independents. With it he received his first recognition as an accomplished artist. Rousseau described his frequent visits to the Jardin des Plantes: "When I go into the glass houses and I see the strange plants of exotic lands, it seems to me that I enter into a dream." As Gauguin said “Take from nature while dreaming in front of it.” When I am photographing for paintings I am in an altered state. 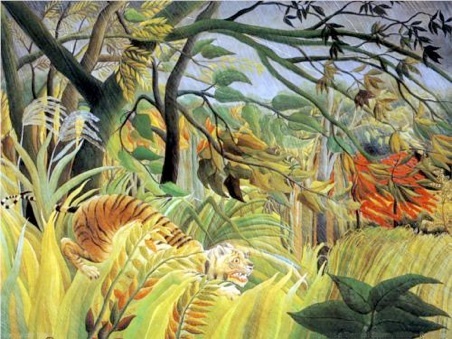 Rousseau was essentially self-taught. Even his painting technique was different. He painted the different colors one by one - first the blues and then the greens and so on - and he painted from top to bottom of the canvas. Though you could argue all artists are self-taught, I have six years of college level art courses and I often paint the same way.